I was born and raised in South Texas so I sorta have a thing for good Mexican food. When we wanting to go out we can just drive around the block to our favorite little hole in the wall. Its called Jalisco’s and its good and its greasy and its comfort food. They sell breakfast tacos for a buck and have the best lemonade around. [Seriously, its magically.] So what does this Mexican food loving Italian girl do? Combine them. 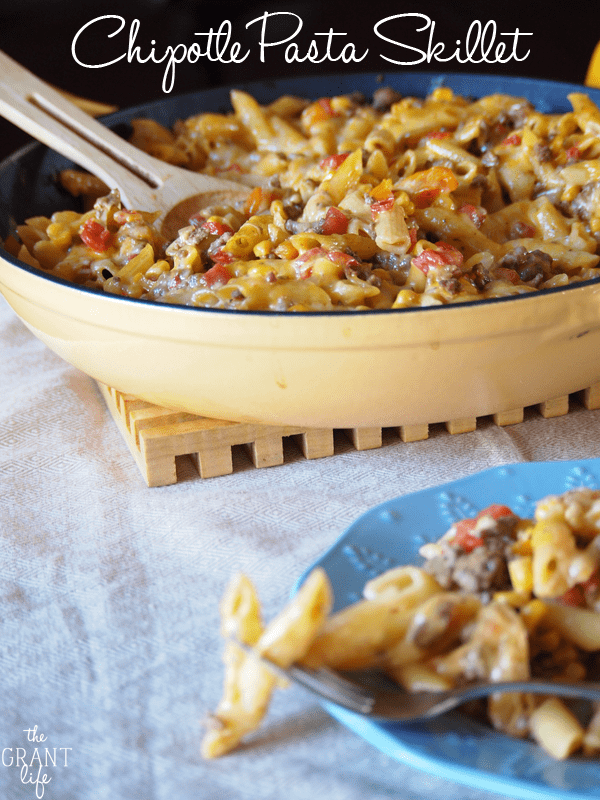 My love for pasta matches my love for Mexican food and the chipotle pasta skillet was born. Besides pasta and Mexican food, I think everything tastes better with sauteed onions in or on it. I start probably 85 perfect of our meals chopping an onion, breakfast included. Its like an immediate flavor booster for everything. So I started with an onion, and added a bell pepper and things just got spicier from there. Oh, and it all goes in one dish. Did I mention that? One pan dinner yall! And after everything was done cooking and dinner was on the table, the kids refused to eat. Ryley went to the cabinet and brought me a can of tomato sauce and said “I want this red stuff on my sketti, mama.” I guess my little Italian girl doesn’t have a taste for the chipotle pasta like her momma. That’s ok. More for momma! Sauteed your onion and bell pepper until the onion is translucent and the pepper is soft in a cast iron skillet. Add your hamburger and spices and cook thoroughly. Pour in the can of corn (water and all) and the crushed tomatoes. Add the pasta on top and the 2 cups of water. Push the pasta under the water and tomato juice and bring to a boil. Boil for 15-20 minutes, or until the pasta is tender and most of the water is absorbed. Pull from the burner and add the shredded cheese on top. Place under your broil for 5 minutes to melt/crisp the cheese. Or sign up for tasty emails and get a freebie! 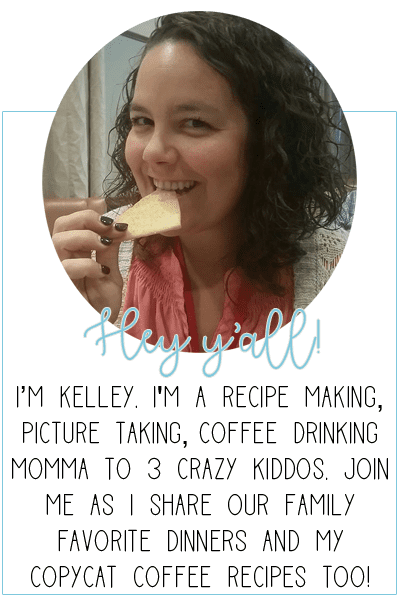 Thank you for sharing this amazing recipe Kelley! Our family tried it this evening and we all LOVED it!! Oh my yum! My husband and I would love this recipe. Pinning and making! I hope yall enjoy it! Its one of our new favorites! Delicious! I’m a huge fan of one pot meals. The best ever. Same here! Less dishes for the win! Haha! That’s too funny. We went out of state once and ate at a little Mexican food place and they served us tater tots as our side. We laughed and laughed. Glad you grew out of the corn shell and ketchup Mexican food. hehe. Thats so much! Ill stop by soon. Yum, yum, yum! That looks so incredible – I wish that were my dinner tonight, or tomorrow night, or the next. Made this for dinner tonight-super easy and everyone loved it! A new favorite! Thanks! Awesome! So glad yall liked it! Its one of our favorites too! Currently eating this delicious meal! I cook hamburger on the side (I’m a vegetarian). This is soooo good and spicy. I’ll definitely make this again, but with less spices! Wheooo! This looks delish and quick. Do you drain the hamburg grease before adding the canned corn and tomatoes? Or are you suppose to use low-fat content ground beef (like 95% lean)? Your pix don’t look greasy, so I’m wondering about the grease from cooking the meat, and not sure if you *need* it in the recipe of not. I have a weakness for Mexican food, pasta, and onions! I cannot get over my dad having a hatred for onions! He is missing out on so much. I cannot wait to try this! 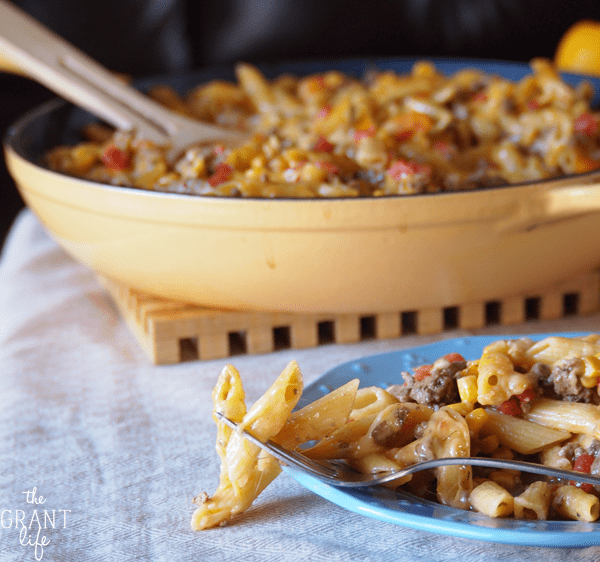 Great idea combining Mexican and Italian and I love making one pot dinners! 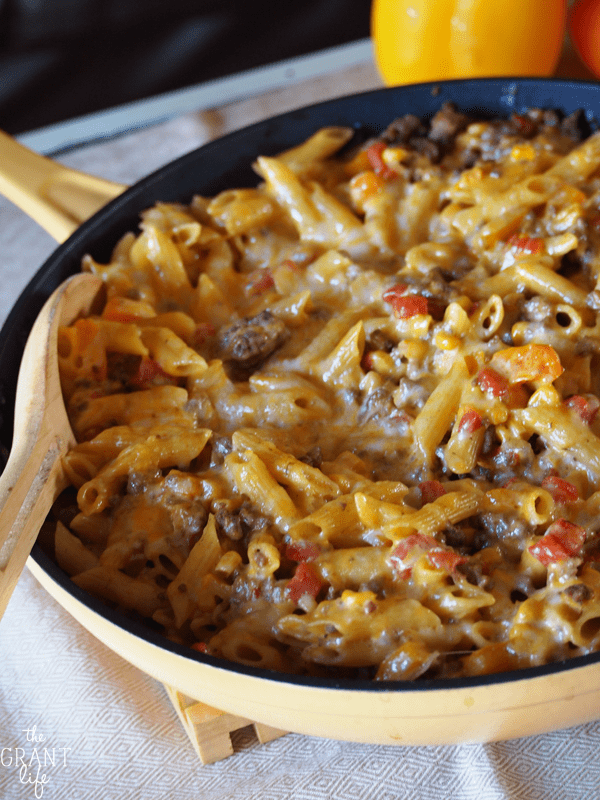 Skillet meals are so easy! Pinned! Chipotle + pasta? Two of my favorites in one hearty dish – I have no doubt I’d absolutely love this dish, Kelley! Two of my favorites too friend! So good together! I could go for $1 breakfast taco right about now. This looks delicious. 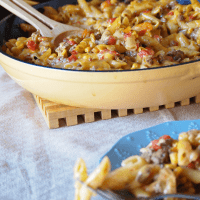 My boys love these kinds of pasta dishes – gotta try this one! This looks so delicious!! Perfect supper idea! This looks fantastic, Kelley. Such great flavors, I know I’ll be making it soon! Kelley, where do you find chipotle corn? I was just at the store and couldn’t find any. There are two different brands that sell it. Green Giant sells one (here is what it looks like – http://amzn.to/1E8OmGx) and then we have a store brand. We shop at HEB so its an HEB brand product in a small red can. I hope that helps! What kind of cheese did you use in this recipe. Hey Jackie! Probably cheddar or colby jack. Hope that helps!